This post is Part Three of a larger series on the Biblical concept of bitterness. Parts One and Two were published earlier this month, covering the “root of bitterness” in Hebrews and the “gall of bitterness” in Acts. Throughout history the taste of bitterness has been identified with the quality of poisonousness. The Cornhill Magazine, published in 1884, says, “Bitter things in nature . . . are almost invariably poisonous.” Because of this, a word originally used to describe bad taste came to describe intense feelings of grief and misery. The bitter thing often contained a poison that led to suffering. The Oxford English Dictionary, which has long been considered the standard of the English language, of course gives the first definition for the word “bitter” as having to do with taste: Obnoxious, irritating, or unfavorably stimulating to the gustatory nerve; disagreeable to the palate; having the characteristic taste of wormwood. . . . After that, there are basically three primary metaphorical uses of the word that apply to a person’s experiences, responses, and actions. These more or less match with the way the Hebrew and Greek words are used in the Bible. *Righteous anger is an emotion that energizes a person to take action to fight against evil. Notice that Experiential Bitterness (#1) and Grieving Bitterness (#2) are definitely causally related. Destructive Bitterness (#3), as we shall see is not necessarily a result of #1 (although it can be), but it will naturally become a source of #1. For the people of the Bible, gall (poison—the Hebrew word is in some cases translated “venom”) and wormwood (a terrible tasting plant), were physical expressions of the experience of bitterness of soul. Combining them in the description of bitterness intensified the expression of the emotion. 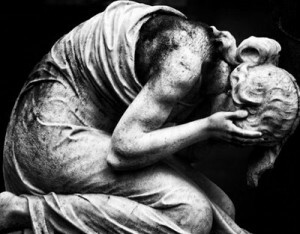 The entirety of this post, which shows the relation between Experiential Bitterness and Grieving Bitterness, is now posted at BJUGrace.